I love the concept of “pay it forward” and encourage a giving nature with my students and family. So… I decided to try another “pay it forward” with my first published book, Messy Jessy. 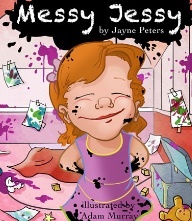 Three teachers (to start) will each be given a copy of Messy Jessy to read with their class and respond to it. When finished, they will pass the book along with a set of instructions to another teacher who would like to use the book in their classroom. Stay tuned! I can’t wait to see how they respond. Also, for every 10 classes that respond (not 10 responses per class) I will do a draw for my latest book, Messy Jessy Gets Active. Note: My books are available on the Nova Scotia Book Bureau. We loved reading Messy Jessy. Messy Jessy is a bit like some of us as she gets food on her face when she eats and wears mismatched socks. We like how Messy Jessy loves herself just the way she is. Hi Primary Corey! I am glad you enjoyed reading “Messy Jessy” and that some of you were able to make connections to things that she does. I love that you understood the real message in the story, that it is important to love yourself just the way you are! I am looking forward to meeting you really soon. I’ll bring the next book about Messy Jessy called “Messy Jessy Gets Active”.